Sophomore guard Jair Bolden drives around Fordham players during the first round of the Atlantic 10 Championship Wednesday night. Men’s basketball earned a trip to the second round of the Atlantic 10 Championship for the fifth consecutive year after besting Fordham Wednesday night. The Colonials (15-17, 7-11 A-10) trailed by as many as 12 points in the first half, but gutted out the 78–72 victory against the Rams (9-22, 4-14 A-10) in a game that saw 16 lead changes and 11 tied scores. Less than 24 hours after the victory, GW will return to the Capital One Arena to take on No. 6 seed Saint Louis. The Colonials lost to the Billikens by nine during their regular season matchup. The scoring was spread out for GW, with five Colonials scoring in double-digits. Sophomore guard Jair Bolden led the floor with 22 points, five rebounds and seven assists. He went 8-for-13 from the field and 4-for-8 from beyond the arc. 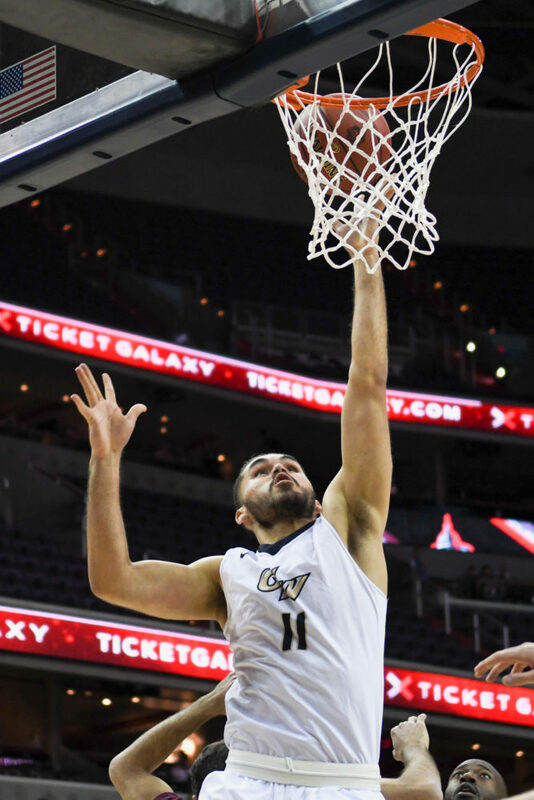 The Colonials went to Bolden on the majority of first-half possessions, while the Rams focused their defensive efforts on senior guard Yuta Watanabe. Graduate student forward Bo Zeigler ended the night with 16 points and seven rebounds after playing just two minutes in the first frame due to foul trouble. Sophomore forward Arnaldo Toro ended the night with his fourth double-double in five games. The Puerto Rico-native tallied 11 points and 15 rebounds, one board off from his career-high. Fordham was led by junior guard Joseph Chartouny, who gathered 18 points on an 8-of-14 clip. Junior forward Prokop Slanina and freshman guard Ivan Raut also scored 15 points each, with Raut grabbing a team-high seven boards. Sophomore forward Arnaldo Toro goes for a layup in the first round of the Atlantic 10 Championship Wednesday night. 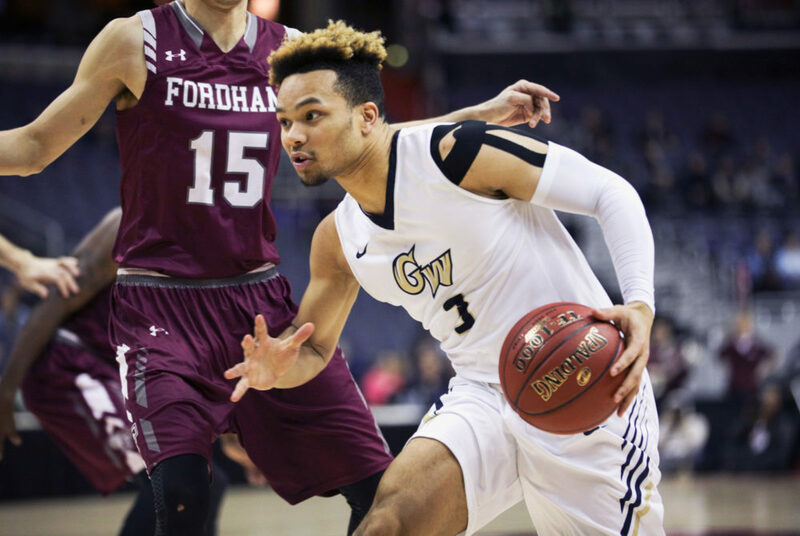 GW played most of the game without freshman guard Terry Nolan Jr. The freshman grabbed nine rebounds and dished out six assists in GW’s last outing against the Rams, but saw only four minutes of action. The Colonials were slow out of the gate to open the game, going 0-for-5 from the field before a jump shot from freshman guard Justin Mazzulla got them their first field goal. Slanina went 3-for-4 from beyond the arc for the Rams in the first five minutes of the contest. “Slanina came out on fire and set the tone for their team and gave them a great jolt of energy and a lot of confidence,” Joseph said. GW fell behind by eight points with just under eight minutes left in the game after going basket-for-basket with Fordham. GW’s deficit grew to 12 points after Slanina made a layup to cap off a 7-0 Fordham run with six minutes left in the game. GW committed seven turnovers to the Rams’ three in the opening 15 minutes, allowing Fordham to pick up 10 unearned points. The Colonials responded with a scoring run of its own, led by Bolden, who picked up five unanswered points with two minutes left in the frame to cap off a 9-0 GW run. Freshman guard Maceo Jack allowed GW to regain a one-point lead after the guard followed a missed shot for a layup with less than one minute left in the first half. Jack ended the night with a career-high 10 points on 3-of-4 shooting. Heading into the break, GW held a 39–38 lead. The Colonials were shooting 50.0 percent from the field, but the Rams were close behind, going 14-for-30. The game was in gridlock to open the second half. Neither side led by more than five points before Zeigler collected eight-straight points for the Colonials to push their offensive momentum. Chartouny kept the Rams competitive in the second half, picking up 14 second-half points on 6-of-8 shooting. Important free-throws from Watanabe made it a two-possession game for the Rams with a minute and a half left in the frame, GW was leading 73–68. Watanabe, who scored a career-high 31 points against the Rams last week, ended the night with 12 points and one rebound. GW gained its largest lead of the night with 10 seconds left in the match, when Zeigler split his free throws to push the Colonials ahead 76-70.